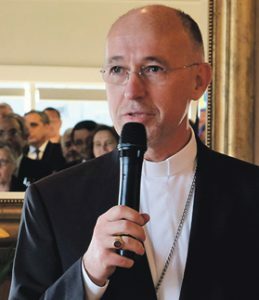 WelCom April 2018: To mark the fifth anniversary of the election of his Holiness Pope Francis, the Apostolic Nuncio HE Archbishop Martin Krebs hosted a reception in Wellington on 14 March 2018. Guests included government officials, diplomats, political and civil leaders, NZ bishops, clergy and religious, representatives of other churches and religious traditions, and a host of friends. The following is from Archbishop Krebs’ speech. “We have good reasons to celebrate not only the completion of a symbolic number of years, but especially the remarkable moves Pope Francis has made. He has shown to be an efficient reformer of the Catholic Church and a courageous world leader, who is not afraid to swim against the current. Over the last year, the Holy Father’s trips abroad were again the events that attracted most attention in the media. He travelled to Egypt in April, to Fátima in Portugal in May, to Colombia in September, to Myanmar and Bangladesh 26 November‒2 December, and most recently to Chile and Peru in January. Francis was the first Pope who has travelled to Egypt and to Myanmar. When Pope Francis addressed the participants of the International Peace Conference in Cairo on 28 April 2017, he spoke about the requirements of a serious DIALOGUE; dialogue not only between religious leaders, but between Governments, politicians, diplomats and just ‘normal people’. His appeal was so important to him, he repeated it literally in his speech to the Roman Curia before last Christmas. Taking into account the grave threats to world order at this moment of history, we understand the Pope does not just accomplish a ceremonial duty when he reminds us of the requirements of a serious dialogue. In his invitation to dialogue we find his very personal ‘way of thinking that recognises opposite poles and seeks to hold them in tension, rather than to resolve the apparent contradiction between them. Francis’ dialectical thinking is the key to understanding this papacy, both the exhilaration it engenders in his supporters and the exasperation of his critics’ (Massimo Borghesi, ‘Living with contradiction’, The Tablet UK, February 2018). The next world event where the Church will practise a challenging dialogue will be the Synod on Young People in October this year. Young people, who will ask serious questions, will look for serious answers; and Bishops, who had traditionally many answers, will question many things! ‘A faith that does not raise questions is a faith that has to be questioned’.